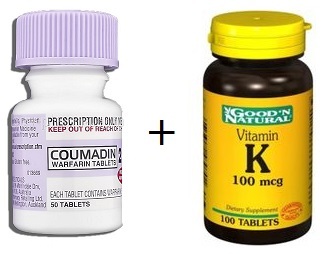 Home » Drug Interactions » Can you take Warfarin and Vitamin K together? Can you take Warfarin and Vitamin K together? What is Warfarin? What is Warfarin used for? Despite its high effectiveness, warfarin therapy has several limitations. Many drugs may interact with warfarin and also some foods particularly leaf vegetable foods as they contain large amounts of vitamin K1. Warfarin dosing is exclusively individual. To ensure that an adequate safe dose is taken, blood testing and counting of INR – international normalized ratio are needed during warfarin therapy. INR measures warfarin’s activity. A high INR value predispose patients to an increased risk of bleeding, while an INR values below the therapeutic target may indicate that the dose of warfarin is unsatisfactory to protect against thromboembolic events. Under its brand name Coumadin it is available in tablet form in next doses: 1 mg, 2 mg, 2.5 mg, 3 mg, 4 mg, 5 mg, 6 mg, 7.5 mg and 10 mg. It also available as an injection (solution or powder) for intravenous use. FDA approved warfarin in 1954. What is Vitamin K? What is Vitamin K used for? Vitamin K is a group of fat-soluble vitamins which are structurally similar. Vitamin K is required for complete synthesis of certain proteins needed for blood coagulation processes. Without vitamin K, blood coagulation will be seriously impaired leading to uncontrolled bleeding. Low levels of vitamin K may also weaken bones and enhance arteries and other soft tissue calcification. Vitamin K includes two natural vitamers: vitamin K1 and vitamin K2. Vitamin K1, also known as phytonadione, phylloquinone or phytomenadione is synthesized by plants, and it is found in highest concentrations in green leafy vegetables. K2 vitamin is produced by bacteria in the gut flora. Three synthetic forms of vitamin K are: vitamins K3, K4, and K5. All K vitamins are proven nontoxic, except synthetic form K3 (menadione) that has shown toxicity. Vitamin K1 or phytonadione is used to treat vitamin K deficiency and to treat certain bleeding or blood clotting problems. FDA approved indications are: Hypoprothrombinemia and Hemorrhagic disease of the newborn. It is available under the brand name Mephyton in tablet form of 5 mg dose. It is also available as a solution 2 mg and 10 mg and emulsion 2 mg and 10 mg for parenteral route. How Warfarin and Vitamin K work in the body? Warfarin works by inhibiting enzyme called vitamin K reductase, which results in a depletion of the vitamin K reduced form, known as vitamin KH2. Vitamin K works as a cofactor for the glutamate residues carboxylation on the N-terminal parts of vitamin K-dependent proteins, this inhibition limits reaction of gamma-carboxylation and subsequent activation of the vitamin K-dependent coagulant proteins. This results in synthesis inhibition of vitamin K-dependent coagulation factors II, VII, IX, and X and anticoagulant proteins C and S. Results of the inhibition of three of the four vitamin K-dependent coagulation factors (factors II, VII, and X) is decreased prothrombin amounts and a decrease in the levels of thrombin produced and bound to fibrin. This reduces the thrombogenicity of clots. Vitamin K is a cofactor that is essential for the gamma-carboxylase enzymes functioning. This enzyme catalyze gamma-carboxylation of glutamic acid residues in inactive precursors of coagulation factors II, VII, IX and X. Gamma-carboxylation transforms these inactive precursors into active form of coagulation factors which are secreted by hepatocytes into the blood. Supplemental vitamin K reverses the vitamin K deficiency caused by warfarin, and therefore antagonizes the intended anticoagulant action of warfarin and related drugs. It is also warfarin’s antidote and is used in cases of warfarin’s overdose. However, in some cases small amounts of vitamin K can be given orally to patients who are on warfarin therapy in order to predict the action of the drug. The anticoagulant action of warfarin is a function of vitamin K intake and warfarin dose and because of a different absorption it must be individualized for each patient. The actions of warfarin and vitamin K both needed 2-5 days after initial use to have maximum effect, and neither vitamin K nor warfarin shows much effect in the first 24 hours after they are given. Recent studies have found that supplementing with low-dose vitamin K (50-150 mcg/day) may stabilize the daily fluctuations in INR values that may occur due to varying dietary intakes of vitamin K. When it is necessary, the doctor may slightly increase the warfarin dose to neutralize vitamin K tendency to increase coagulation. One study conducted at Massachusetts General Hospital in Boston observed the effect of different dietary vitamin K intake on the INR values in patients receiving warfarin therapy. Study showed that, as vitamin K intake increased, INR became more regular and stable. On the other hand, when vitamin K intake decreased, INR became more variable to a greater extent. “Patients taking warfarin and consuming markedly changing amounts of vitamin K may have a variable weekly INR with potentially unstable anticoagulant outcomes,” the researchers wrote. However, patients who already established control over warfarin’s anticoagulation should be aware that vitamin K may reduce their INR values, thus requiring an increased dose of warfarin for optimal anticoagulation effect. Patients taking warfarin need to tell their doctors if they use multivitamin supplements. When changes in INR are unexplained, doctors should also ask about vitamin K use. Vitamin K may also reduce dangerously high INR levels and allow patients who are on anticoagulation therapy to safely undergo surgery earlier than they could without vitamin K. In order to reduce high INR values in patients using warfarin, oral and intravenous methods of vitamin K administration are similarly effective.